This is the Venezuelan Tricolori in 1830, right after the split of the República de Colombia. It sports the Venezuelan Coat of Arms under the "Great Colombia" (downward cornucopias, and a hoist-facing fasces and ax; as opposed to that of the "Great Colombia" [later adopted by Nueva Granada], which had upward cornucopias and a fly-facinf fasces and ax). It was a square flag, to diferentiate itself from those of Nueva Granada and Ecuador. Later, it adopted the same-width stripes we know today, for further differentiation). Provisional Flag of Venezuela, 1830 - It consisted of the Flag of 1811 in whose center it appeared a Coat of Arms derived from the Great-Columbian in which the cornucopias were overturning their fruits towards the base with the inscription ESTADO DE VENEZUELA (STATE OF VENEZUELA) in occasions and others, the one of REPÚBLICA DE VENEZUELA (REPUBLIC OF VENEZUELA). Adopted: 14 Octuber 1830 . Abolished: 16 April 1836. Is was reported also with the shield and inscription in the canton. No. 1041 - Venezuela - War. Presumed Venezuelan State and War Flag (1830): It's a free and particular interpretation registered in Mr. Steenbergen's book "Flags of all the Nations", published on 1862 by Weytingh & Brave Company: Amsterdam, Netherlands. Note the peculiar configuration of the Coat of Arms on the canton. The flag is uncertain and subject to further investigation. No. 1157 - Venezuela - War. Presumed Venezuelan State and War Flag (1830): It's a free and particular interpretation registered in Mr. Steenbergen's book "Flags of all the Nations", published on 1862 by Weytingh & Brave Company: Amsterdam, Netherlands. Note its similarity with the Uncertain Flag of the General Captainship of Venezuela (1777). The flag is uncertain and subject to further investigation. In the flagbook of Mr. W. Wezepoel, from 1862, which is stored in the Zeeuws Archief in Middelburg. (NL): Venezuela - green with yellow saltire. No. 1016 - Venezuela State and Navy/Venezuela Navy (at the mainmast or mizenmast): General on board. No. 1038 - Venezuela (at the mainmast): Captain - Commander of a squadron or in comission. Adopted: the shield was changed on 16 April 1836 ; four days later the stripes were declared to be in the same size. Concering <homes.acmecity.com>, This site, and every other source but one that I have seen, shows that Venezuela's flag has always been a version of the YBR Miranda flag. The Norrie/Hobbs Flags of All Seafaring Nations, 1848, shows Venezuela's flag as a yellow saltaire on green field (plate XXIII). I am sure that must an error, but does anyone have any information or speculation about how that error arose? Flag of the Republic of Venezuela, 1836 - Decreed by the National Congress, it consisted from top to bottom of equal and horizontal strips with colors yellow, blue and red in this order. The character distinction of the National Flag was established in addition because is determinate that for official use it would also bear the Coat of Arms of the Republic and therefore since then we can affirm the traditional existence of the State National Flag and the Civil National Flag although its use were indistinct. Flag from SIEGELs flagcharts: Venezuela merchant ensign 1858 - It is a square splitflag having three tails. The height of the cut out triangles is estimated 1/5 of total width. The colours are ordered horizontal red over white over blue. In the fly end of the white stripe is a yellow 6-point star. Source: [sig12] flagchart 64; row 1 column 3. Adopted: February 1859 Abolished: June 1859. Flag of the Federation, February 1859 - The established Provisional Governing Corp in Coro, city on the Northwest of Venezuela and present capital of the Falcon State, is gone too far in its presumed faculties and decrees that the Flag of the Venezuelan Federation would be the same one of 1836 but with inclusion of seven five pointed and blue stars on the yellow stripe in memory of the Provinces that founded the Nation on 1811. No. 1042 - Coro, Venezuela. Presumed Federal Flag of Coro (1859) : It's a free and particular interpretation registered in Mr. Steenbergen's book "Flags of all the Nations", published on 1862 by Weytingh & Brave Company: Amsterdam, Netherlands. Note the peculiar disposition of the stars on the canton. The flag is uncertain and subject to further investigation. No. 1043 - Uncaptioned [Must be a variant of Venezuela federalist]. Presumed Federal Flag of Coro (1859) : It's a free and particular interpretation registered in Mr. Steenbergen's book "Flags of all the Nations", published on 1862 by Weytingh & Brave Company: Amsterdam, Netherlands. Note the white canton and the peculiar disposition of the stars on the canton. The flag is uncertain and subject to further investigation. Adopted: June 1859. Abolished: 29 July 1863. In 1859, the Federation War revolutionaries resolved that all three bands in the flag had to be even. And then, changed the number of stars to twenty (in representation of the 20 federated states of Venezuela). Flag of the Federation, June 1859 - Triumphant in Barinas, region on the Southwest of Venezuela, General Ezequiel Zamora commits another excess decreeing that in successive the so called Federal State; Pavilion would take twenty five pointed and blue stars: one by each state that would conform the Venezuelan Federation. At this point the practical object of this Flag and its antecedent seems clear: to be different itself from which identified the troops of the Government who took or not the Coat of Arms and have not stars. In 1863, Venezuelas president, Juan Crisóstomo Falcón decides to restore the seven stars, but this time, in white and over the blue band. Also, 6 of the stars had to be placed in a circle, and one in the middle of it. In 1897 : Yellow blue red horizontal with 6 white stars in circle around the 7th in the middle. W the same with state arms in canton. In a documentary about the river Orenoque, there were images from the late 50's showing a joint Venezuela-Brazil commission tagging the border between the two countries. The Venezuelan flag had an unknown-to-me star pattern, in an hexagonal way (a star on each vertex of the hexagon, the seventh in the middle of the hexagon), and no shield near the hoist in the yellow stripe. Was it a variant of the national flag ?" This pattern was obsolete by the 1950's. The 1917 National Geographic magazine Flag Number shows the Venezuelan national flag with the stars arranged in a cluster as Ivan described. The Ensign was the same except the arms are in the upper left corner. Smith's 1975 FTTAAATW is silent on the adoption date of the current star arrangement. 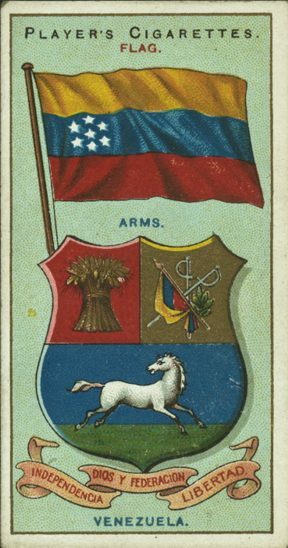 At "Nouveau Petit Larousse Illustre" (1924), Venezuela flag looks like the 1863 version. It does not have the stars near the hoist. Flag of Venezuela, 1863 - Field Marshal Juan Crisóstomo Falcon, in exercise of the Presidency of the Republic, emits a decree signed by all his ministers in whom he establishes that the National flag would be yellow, blue and red in equal and horizontal strips with seven five pointed and white stars disposed on the center of the blue stripe: six in hexagon and seventh in the middle, reserving the addition of the National Coat of Arms only to the one of Official Use. All 50 Player's cigarettes 1905 cards of the series Countries Arms & Flags [g9b05] are on line at <digitalgallery.nypl.org>. For Venezuela, the card shows an equal horizontal tricolor with seven stars clustered in three staggered columns (2+3+2) placed very near the hoist. Flag of Tribute, (1876): This design was made as a special homage of the resident English Colony in Caracas with regard to the transfer of the rest of El Libertador from the Cathedral to the National Pantheon in Caracas. Consist in a horizontal tricolor yellow, blue and red that reproduces one of the projects of Coat of Arms for the Great Colombia, which appear since 1821 on the yellow stripe. The illustration is a representation of the original one that still is conserved in the Bolivarian Museum of Caracas. Adopted: 28 March 1905. Abolished: 10 February 1954, when the current flag was adopted. In 1905, President Cipriano Castro orders to place the 7 stars in circle. Between 1913 and 1941: a yellow, blue and red horizontal tricolor with the arms in the canton and seven stars toward the hoist on the blue stripe with six surrounding the seventh. On the merchant ensign the state arms are absent. Flag of the United States of Venezuela, 1905 - The President of the Republic, General Cipriano Castro, decrees that the National flag would take stars in circumference, maintaining its distinction of character. The dates might be read too, but I dificultly, and I am sure that these would be the same as today. Was this Coat of Arms ever official? Accoerding to Christan Siemer's site, the Coat of Arms should have included stars in an arch above the cornucopias, and inscription in the lowest ribbon EE. UU. DE VENEZUELA. And an other thing, the ribbons seems to be blue-white-red tribands, but this may be just a printing effect. - National and Merchant Flag (2:3) - This one without the Coat of Arms. Flag of the Falke's Expeditionary Corps (1929): The conspirators that under the command of Admiral Roman Delgado Chalbaud tried to take Cumana (city located at the North-West of Venezuela) with the purpose of initiating a revolt to overthrow the regime of General Juan Vicente Gomez, were organized in battalions identified with flags whose design we reconstructed in the graphic: on the obverse, the field appears divided on three diagonal stripes: yellow, blue and red, bearing in the middle of blue a constellation of seven white stars - six in hexagon and one at the center - while the National Coat of Arms with a yellow pennant and crested with stars appears on the superior canton near the staff, complementing itself with the word "LIBERTAD" (Liberty) on the yellow stripe and the word "JUSTICIA" (Justice) on the red stripe, both embroidered in gold and made in capital roman letters. To reverse, naturally divided in the same colors disposed on inverted sense appear the motto "HONOR Y PATRIA" (Honour and Homeland) and the denomination of the Battalion Nr. 6, in this case - also embroidered in gold and inscribed in the same type of letters already mentioned.